At the heart of each drum is a core character that's appreciably different from its siblings. More importantly, every one of these 5" Elites performs in sublime fashion, making the line an agreeably affordable pro-level proposition. You're unlikely to be underwhelmed by any of them. Classy understated appearance and super-solid tone. You might find yourself fancying more than just one. The brass snare has a timeless finish. Steel: Marginally the brightest of the five. 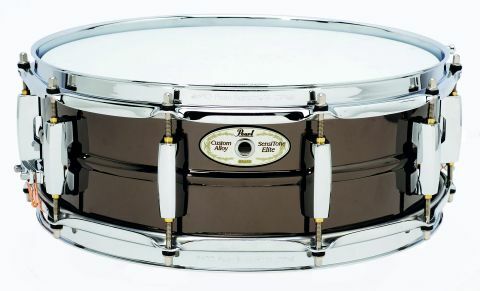 The phosphor bronze snare is perfect for vintage breakbeat grooves or jazz. Both steel snares excel themselves in terms of strident delivery. The aluminium snare is extremely articulate. A diverse range of mystical metallurgy' - that's what the Pearl Sensitone Elite snare series offers us, apparently. Sounds good, doesn't it? We're not entirely sure where the 'mystical' bit comes in, but there's certainly some serious metallurgy going on in the line-up. Steel, stainless steel, aluminium, phosphor bronze and brass are the materials to choose from, all of which are available in both 14"x5" and 14"x6½" sizes. Usefully, in terms of like-for-like comparison, the five review models are all 5" deep and all display purposeful, workman-like aesthetics. That's not to say the Sensitone Elites aren't good-lookers, more that their appeal lies in their understated, but nicely appointed, appearance. There's no fancy engraving or crazy colours here, instead each drum is simply highly polished - with the exception of the slightly less shiny aluminium model. The drums all share much else in common. The beaded shells are equipped with sleek one-piece lugs (which benefit from being fitted with threaded brass inserts, which is always a nice upmarket touch) and a simple, easily adjustable strainer. And because there's no brash finishing to detract from the basic quality of the build, the drums exude an air of quiet professionalism. Just as super-quick Audis are the finest Q-cars, so the Sensitone Elites may yet prove to be sonic wolves in sheep's clothing. And we like them already because of that. Cool looks aren't going to be enough to impress us though. Pearl's standing in the 'high-end but affordable' snare market is such that these Elites need to display masses of tonal quality in order to keep the flag flying. To justify their existence, each one needs to stand distinct from the others in terms of the way it sounds and responds. There's no point in the range being full of overlapping models, after all. We'll deal with the latter point once we've run through the way that each individual drum acquits itself. But first comes the fun bit of playing the five, swapping between them, fiddling with different tunings and trying to keep the ears fresh... It is almost impossible not to approach the quintet without having already subconsciously decided which is going to be the favourite. So we kicked off with the Plain Jane steel shell drum - without meaning to be disparaging, this particular model is the least exotic of the five, and is arguably as good a place to start as any. If this one impresses then things bode well for the more glamorous members of the family. While many of the features of the Elite series are shared among all models, one thing that does differ between several of them is shell thickness. The steel drum has the thinnest of the lot, at a slender 1mm. It might be the least instantly interesting of the line here, but as soon as stick hits batter head, the 14"x5" steelie sets out the Elite stall in grand style. Straight away it's clear that this is a serious proposition, as indeed should be the case with any snare bearing the Sensitone moniker. We're in favour of using as little damping as possible and this drum makes this eminently possible. Sure, it's bright and crackly, but any grating, ringy overtones prove relatively easy to reduce with a bit of careful tuning. The straight-up steel shell is marginally the brightest of the five, with the stainless steel version coming in a close second. It's a tad less 'crispy' on ghost notes and discernibly more focused, although there's still that typical steel 'slice' to each stroke - a tonal characteristic that reflects the fact that shell thickness is upped to 1.2mm (a feature shared with the aluminium and phosphor bronze types). Both steel snares excel themselves in terms of strident delivery and will happily power the most energetic of pop/rock/funk acts. The 5" depth keeps things nice and tidy but if there's just not enough low-end wallop for your tastes, then the 6½" snare should deliver what you need. The next pair to take their places on the stand - the brass and phosphor bronze - were assumed favourites based on looks and specification alone. There's something timeless about the way these drums are finished, and the contrast between the black/bronze and the simple chrome hardware looks choice. Of the two, the 1.5mm thick brass is perhaps the best multi-purpose option (and it retains that crown when considered among the series as a whole). Its robust, punchy retort and simultaneous sensitivity mark it out as a real gem. Damping only needs to be added to taste, rather than out of necessity, and it works really well over a generous tuning range. While we're dishing out awards, the phosphor bronze snare waltzes off with that for Most Character. Tuned at just below mid-tension, the drum responds with a delicious, funky, slightly flappy note that's endearingly plummy. For vintage breakbeat grooves or jazz, it's the pick of the bunch, and looks suitably cool to fit right in with the respective images. On to what the badge describes as the 'aluminum' drum (we'll stick to adding the extra British 'i' I think). Pearl has this one tagged as the driest of the Sensitone Elite series, but that shouldn't lead to the conclusion that there's a lack of sparkle or snap in the high-end. The aluminium snare is, in fact, extremely articulate - the pronounced definition in each stroke making for a nicely crisp, easily recordable tone. To answer the question of whether each of these Sensitone Elites stands in its own unique tonal ground - no, not entirely. Different heads, recording techniques, playing approaches, etc, mean there's plenty of scope to get the steel snares less ringy and the drier varieties more open-sounding, so there's inevitably potential for overlap.